When Henry Neuburger chaperoned a group of St. Albans high school students to the Vietnam Veterans Memorial in Washington, D.C., a few years ago, he was moved, he says, but he wasn’t emotional. “That might change when it comes to St. Albans this week,” says Neuburger, secretary of the Vietnam Veterans of America (VVA), Chapter 753, in St. Albans. The “it” in this case is the Moving Wall, a half-size replica of the Washington memorial. The Moving Wall will be in St. Albans City’s Taylor Park from May 15 to 19 and could draw thousands of people from New England, upstate New York and Canada. “I look forward to seeing a great number of people come to the community, and to see vets come and make peace with themselves,” says Neuburger, who served in Vietnam as a Marine from December 1967 to August 1969. The original wall was designed by Maya Lin, at the time a 21-year-old architecture student at Yale; made of black marble, it’s a sinuous expanse almost 494 feet long. The latest version of the touring replica is made of aluminum; it is nearly 253 feet long and stands 6 feet tall at its highest point. All 58,000-plus names of the American soldiers who died in the Vietnam War are inscribed there. Vietnam veteran John Devitt built the Moving Wall with others after he attended the dedication of the original in 1982, and realized many Americans might not be able to see it. “It’s there for people that can’t make it to Washington, or that might never go to Washington,” Neuburger says. Successful fundraising allowed Devitt et al. to build the first mobile version from Plexiglas, with silk-screened names. 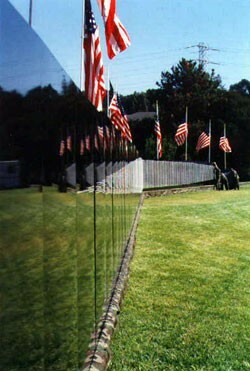 The Moving Wall made its debut in Tyler, Texas, in October 1984. There are actually three replicas now traveling the U.S. from April to November each year, spending about a week at each site. The walls’ off-season home is in San Jose, California. The Moving Wall has been to Vermont several times before, but perhaps its most notable stop was Enosburg, in 1997, when 10,000 people swarmed northeastern Franklin County to see it. Neuburger says there’s a chance St. Albans could field even more visitors, given interstate access on both ends of the city. That could deliver a quick jolt to the downtown economy. The VVA Chapter 753 has spent months planning the Moving Wall’s stop here. St. Albans City aldermen approved the event over the winter. About 100 volunteers will work throughout the weekend, preparing and serving food, providing overnight security, and helping people find specific names on the wall. Organizers have scheduled a 1 p.m. parade through St. Albans on Sunday, to be followed by a ceremony that features remarks by Gov. Jim Douglas and Marty Manahan, St. Albans’ mayor. The ceremony will include a reading of the names of Vermont soldiers who died in Vietnam, as well as those who have died in Iraq. Neuburger is eager to see the wall and how other veterans react to it, but one thing disturbs him: Of all the school groups the VVA Chapter 753 invited to the Moving Wall, only two responded.